The South Tweedsmuir Park area within the western edge of the Chilcotin is a great snowmobiling area but only in a predefined area that has been agreed to with all motorized and non-motorized winter recreationists. This avoids conflicts and respects important wildlife habitat. Please respect this agreement and read the BC Parks South Tweedsmuir Website for more information. 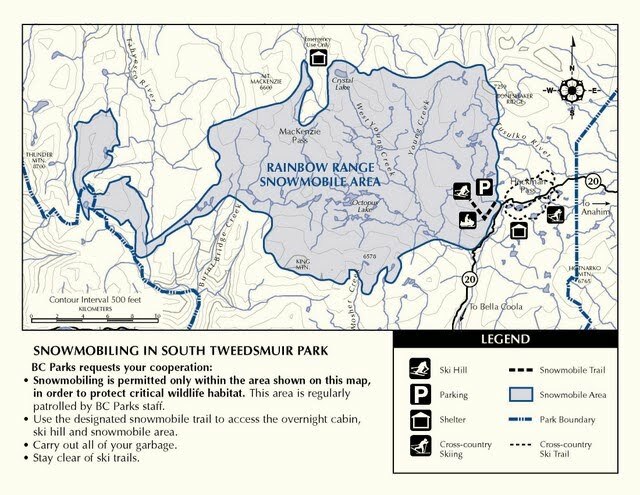 A large area has been designated for snowmobiling which is accessed from the parking lot at the Rainbow Range Trail head. A groomed trail leads into the alpine area from the parking lot and once in alpine there are no designated trails, so please know where you are at and stay out of the closed area.